The football boot… a commodity that has seen dramatic changes over the years and is in constant state of development in the modern game. From metatarsal protection to studs versus blades and the myriad of other “technical innovations” incorporated by manufacturers over the years, the variation in the football boot market is astounding. 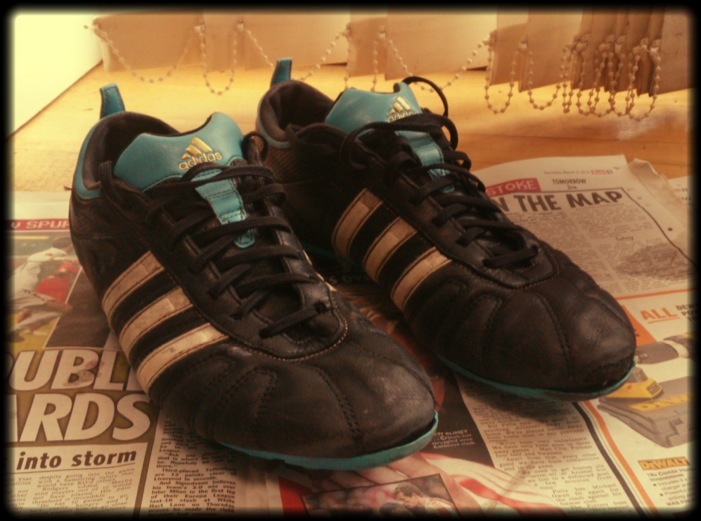 A pair of my all time favourite boots, Adidas Copa Mundials. I have worn numerous pairs of football boots in my time, but at the start of this season I had trouble finding a pair that I really liked. When I walked into the first shop, which happened to be the latest incarnation of JJB Sports one Saturday morning in August 2012, I took one look at the shelf of football boots before me and let out a big sigh. The shelf I was confronted with was a complete rainbow of colours, materials and styles, which may drop the jaws of all the young kids who are just starting their football careers, but not me. Then I immediately realised what the answer to that question was. Essentially it will be the Mums and Dads of those kids who are just beginning their careers in the game, those kids who want to look like Cristiano Ronaldo or Lionel Messi. The marketing implications are plainly obvious if not a complete attempt by the manufacturers to brainwash the consumer, “These boots will make you play like your hero.” However, the marketing and corporate side of football merchandise is a separate debate best saved for another day. My main pet peeve with the modern day football boot is simple, the aesthetics. Call me old school or outdated, but I prefer a simple, black boot with laces down the middle and studs on the bottom. None of this over-elaborate colouring, side lacing, control, technique and/or shot improving additions passed off as “technical innovations” appeal to me in any way. One of the only times I have ever worn a pair of; for want of a better term, flamboyant boots was back in the 2004/2005 season. I pestered my Dad into buying me a pair of the £100 plus, blue Adidas Predators which were worn and promoted by Frank Lampard at the time. The only reason I asked for these was for the simple fact I wanted to be able to play like the Chelsea and England man. Looking back now, I feel horrendously guilty to the point where I almost want to reimburse my Dad the money he shelled out on those boots. They lasted about 7 months before they began to deteriorate and the first thing to go was the attachment of the boot itself to the sole. As grass and mud got stuck in the cavity it became progressively worse until the sole was no longer attached at all. And thus, a pair of boots that cost over £100 were tossed away after just one season and I have never bought a pair of Predators since. The other pair of exuberant boots I can remember wearing in my teenage years were the Nike Air Zoom Total 90 II’s from around the 2003/2004 season. I had the Grey versions so they weren’t overly extravagant but on reflection these boots were relatively flashy at the time. However, they were comfortable to wear, I enjoyed playing in them and they lasted me a whole season until, rather than fall to pieces, I grew out of them. But as the times changed and the Total 90 evolved, I began to dislike the new look of the boot completely and once again, I never bought another pair. After the demise of my Predators in 2006 I decided that I would stay away from overly expensive boots and my list of purchases since has been about as simple and reliable as it gets. The Adidas World Cup and Puma King have been my footwear of choice with a pair of Nike Tiempo’s thrown in for good measure. However, the Tiempo’s also went to an early grave as well after a fateful pre-season game on a sundried pitch. To return to my dilemma, it took me several visits to various sports shops before I finally decided on a pair of boots which I liked and felt comfortable in. In the end I settled for a pair of Adidas AdiNova’s in Black with white stripes and a little bit of green in the mix. I have previously bought the firm ground AdiNova’s (“Mouldies” to all the footballers reading this) for 5-a-side games on 3rd Generation Astroturf and they have never let me down, so I was not completely new to these particular boots. At the time of purchase they cost me a meagre £34.99 and for that price I have been very happy so far. After 8 months of use they have yet to fall apart or show any signs of major wear and tear for that matter. Essentially, these boots are just the poor man’s version of Adidas’ AdiPure line but at half the price. Despite the price inferiority they look very similar and no doubt perform just the same. 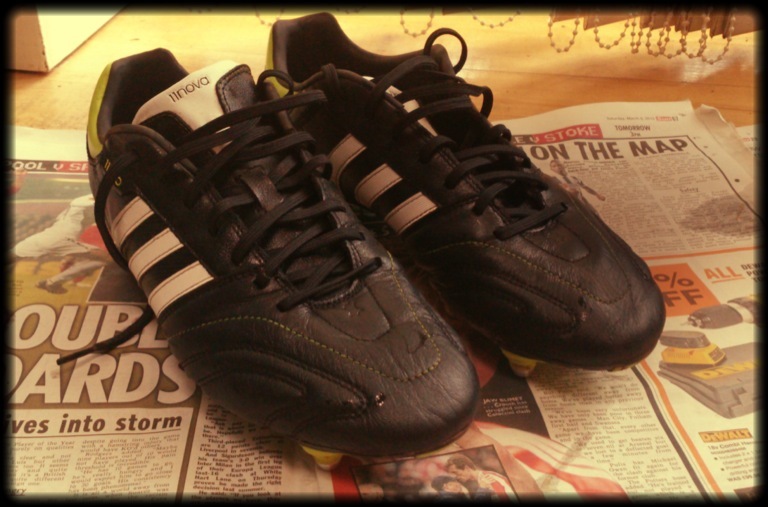 My Adidas AdiNova’s for the 2012/2013 season. There are a few other options that I would like to try such as the blacked out Adidas AdiPure, Mizuno Sonic Club or the Cruyff Hattrick, all of which appeal to my taste for classics and simplicity. I would also not discount another pair of Predators even if they are overpriced, but only the original colours of black, red and white. Having said all that, the range of obscure football boots on sale still makes me wince and simply browsing the Pro Direct Soccer website is enough to make me feel a little nauseous. All combinations of colours and styles seem to be accommodated for, ranging from Nike Vapours to Adidas F50’s and everything in-between. I may just be very cynical when it comes to football boots and admittedly I have not worn the majority of those which grace my imaginary hate list to make a truly sound judgement on their overall quality and performance. I suppose it’s a sort of boot prejudice for me, born out of lifetime of football as a defender. The entire debate around boots comes down to individual opinion but personally; I would like to see more options for what I would term, the “normal” football boot for the classic player. 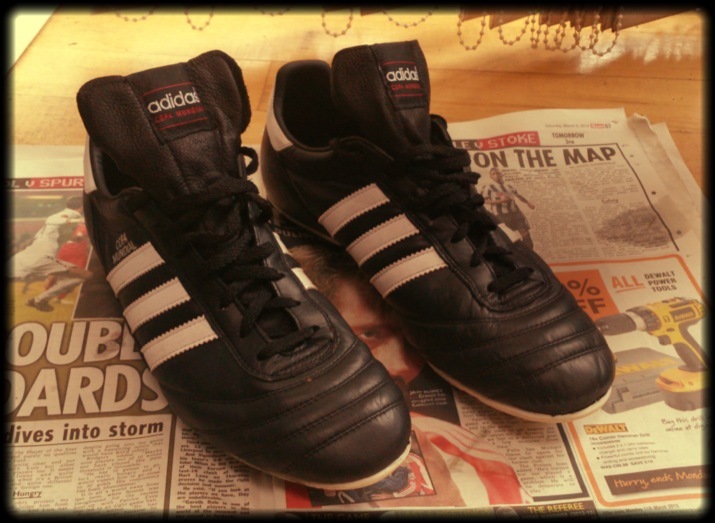 My old pair of mouldies, replaced by the Copa’s above. i have adipures (adinovas) there are by far the best boots i have ever worn, i like the flashy colours i have the blue,white and orange ones and i have never worn anything so comfortable, they actually mold your foot perfectly, but whats your thoughts on the nitrocharge 1.0 there basically upgraded adinovas but with a different technology. While I don’t mind a flashy boot from time to time (I’m a sucker for white kicks), I can certainly understand your desire for more simple design aesthetics. Luckily, there’s a growing a contingent of players out there that share your sentiments, and brands have popped up to meet the needs of the market. Pantofola d’Oro, Cruyff and Pele Sport are newer brands that offer a diverse selection of simple boots, though established brands like Hummel and Asics still offer simplistic boots too. There are options out there, it just takes a little more effort to get your feet into them. Thanks a lot for your feedback D.J! I really appreciate it. I came across a pair of Cruyff boots online and they were particulalry attractive. I think its a case of brand power to be honest, images of Nike and Adidas are usually plastered all over sports shops and websites and the ‘football boots’ section is usually dominated by these two. As you said it takes a little more time to find the alternative options. Thanks again for your feedback and encouragement! But I did like them as a boot, probably better than the Copa in terms of traction and touch on the ball. The insoles wore out first and were replaced. Next to go was the upper separating from the cleat. Both were (are) great boots, but I would probably still have my Copas if someone would have returned them after borrowing them. I don’t like the flashy colors much either, black is still my favorite. Looks tougher and meaner. I remember a fair few people I played football with at school who had the old Predators and all of them had the same problem with them after a couple of months when they just began to fall apart. As an overall boot, I would say that Copa’s and World Cups are the way to go. They’re reliable, comfortable and performance wise they have never let me down. Well, seen as blades were responsible for Saturday’s knee massacre, it’s safe to say I’m against those! Adidas have got it about right, for me. They keep the youngsters happy with the flashy nonsense (F50s), while placating the older heads with traditional styles, unchanged in 30 years (Copa Mundials, World Cups). They also bridge the gap between the two with some innovative styles that maintain a traditional aesthetic (AdiPure, AdiNova). Adidas aside, the Italians have always led the way. Diadora, Lotto, Pantofola D’Oro, etc, all hark back to a simpler time (fearing sounding like a ‘football hipster’, I leave out any mention of James Richardson and Italian football on Channel 4). Having said all that, I have a vague memory of Rui Costa, socks round his ankles, in a pair of Nike Tiempos (black leather, white sole), dancing around challenges at some point in the mid-90s. I think that was the first time I felt a genuine, spiritual longing for a pair of boots. I was convinced that owning them would automatically transform me from a bang average midfielder into a nonchalant playmaker. How wrong I was. I could go on, but I’ll pack it in now. In summation: footy boots are boss. Completely agree Gaz! I’ve heard some horror stories about blades not to mention the rumours they destroy the wearers knees (and yours on Saturday!). I never really thought about the boot issue on a regional basis, but Diadora is a good shout. I remember Gary Neville rocking a pair in the 90’s. Also Rui Costa!. Class player!